I found this recipe on Pinterest in.. November? December? Around the holidays, at any rate. Joe drooled when I told him about it, so I promised him I'd make them. Gingerbread is probably one of his favorite holiday flavors. Then, like any good future wife, I promptly forgot all about it. Until a couple of weeks ago, that is, when I saw this recipe in my cabinet and said, "Oh yeah! 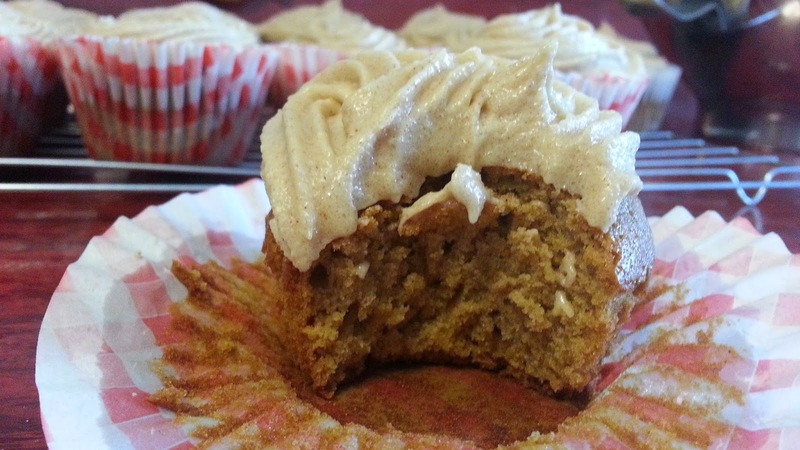 Gingerbread cupcakes!" and decided to make them. The recipe as it was provided needed some help, but what I've provided below is my adaptation. 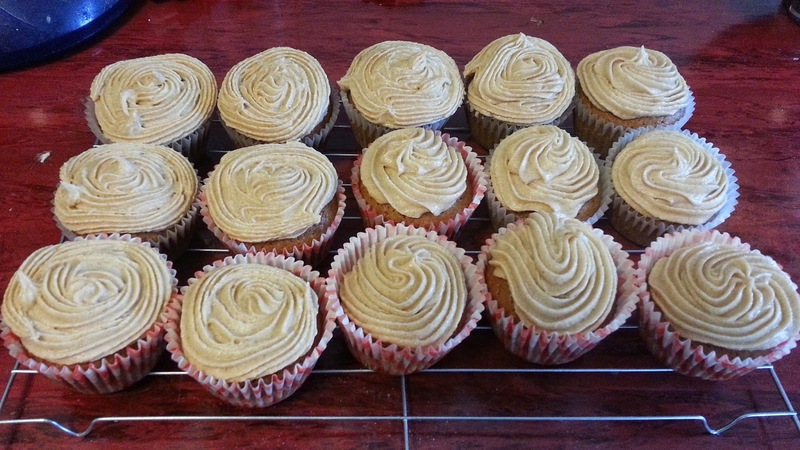 The batter gives you enough for about 18 regular sized cupcakes. 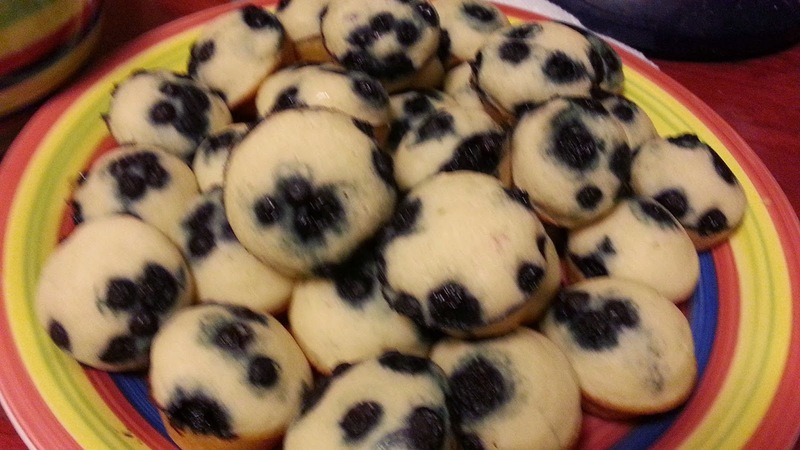 This was one of those pins that just provides the recipe and doesn't link back to the original source, so unfortunately, I don't have the slightest idea where these came from. Even with the changes I had to make, these came out AMAZING. As in, I can't wait to make them again incredible. Like, thinking about trying them in my square muffin tin, wondering how many mini cupcakes this would make and if it would bake well in an actual bread pan sprinkled with cinnamon sugar. Enough already - just go get in the kitchen and make these! Preheat oven to 350°F and line a muffin tin with cupcake liners (or spray well with non-stick spray). Cream together butter and sugars until light and fluffy. Add eggs, vanilla and molasses and mix until smooth. Stir in flour and spices. Spoon batter evenly into cupcake liners. Bake for 20-25 minutes until tops spring back when lightly pressed and a toothpick inserted in the middle comes out clean. Let cool for a few minutes in the pan, then transfer to wire rack to cool completely. 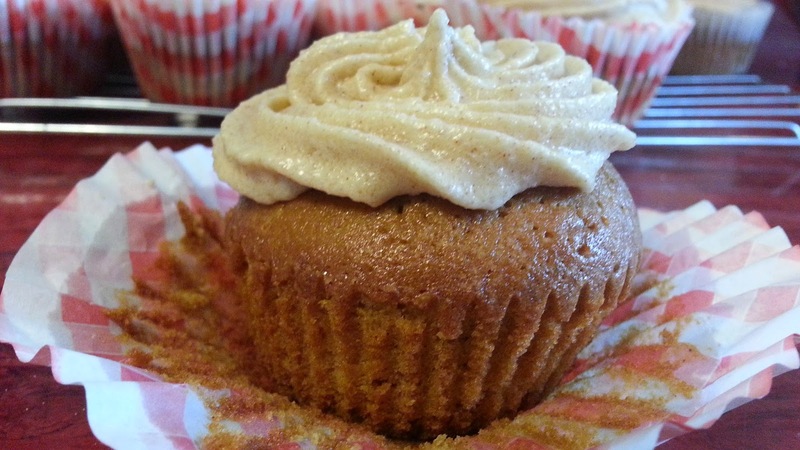 While cupcakes are cooling, make the frosting. Cream butter, cream cheese and vanilla until smooth. Stir in the cinnamon. Add in the sugar, one cup at a time, mixing thoroughly until combined. Add milk 1 Tbsp at a time, as needed, until desired consistency is reached. Beat 3-5 minutes until frosting is fluffy. Spread or pipe onto cupcakes. *note: you'll notice that there is no leavening agent in this recipe. That is correct. DO NOT add any baking soda, baking powder, etc. Today's National Pancake Day, so I wanted to make sure you had an easy way to partake in the celebration. I used boxed pancake mix for this, partly because that's what we had on hand and partly because this was a fairly spur of the moment idea. Joe's mom usually gives us a box of breakfast stuff every year for Christmas, so we pretty much always have pancake mix in the cabinet. Perfect when you just want to whip some up super quickly. These are definitely going on our "make again" list. Joe and I LOVE breakfast for dinner, but it can be awfully time consuming and intensive for just the two of us. We'll sometimes get friends together and cook for them, which doesn't make pancakes/french toast, bacon and home fries any less time consuming, but does make it feel more worth it when you're cooking for five or six people than just for two. Awhile ago I saw something online that suggested doing this and mentally filed it away for a rainy day. Or, in this case, a Sunday that included the conversation, "shoot, it's 3pm, what are we making for dinner?". Heather to the rescue! Grease a 24-count mini muffin tin and set aside. Mix up 2 cups of your favorite pancake mix. 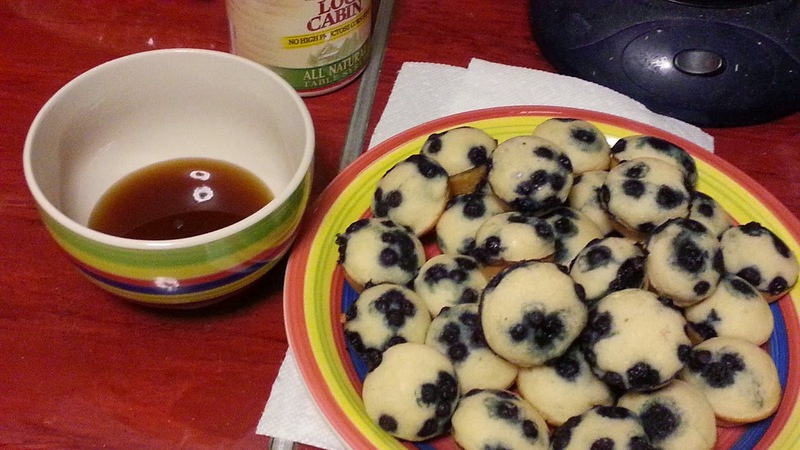 Spoon your pancake batter into well-greased mini muffin tins. 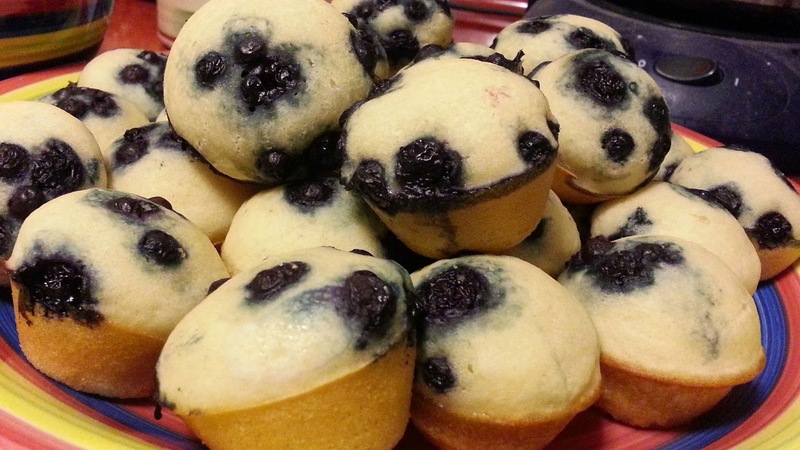 Top with blueberries (or other topping of choice) and bake for 11 minutes. Let cool for a couple of minutes and use a sharp knife to help you get them out of the tins. Serve with maple syrup for dipping. I got about 36 minis out of 2 cups of batter, which was perfect for just the two of us. What are your favorite pancake toppings?